If the Devil were trapped and asked you to set him free, would you do it? Of course not, you reply. But what if he were disguised as a man, and a very sympathetic man at that? Doesn’t matter, you answer. You’d see right through him. We all like to think we would. 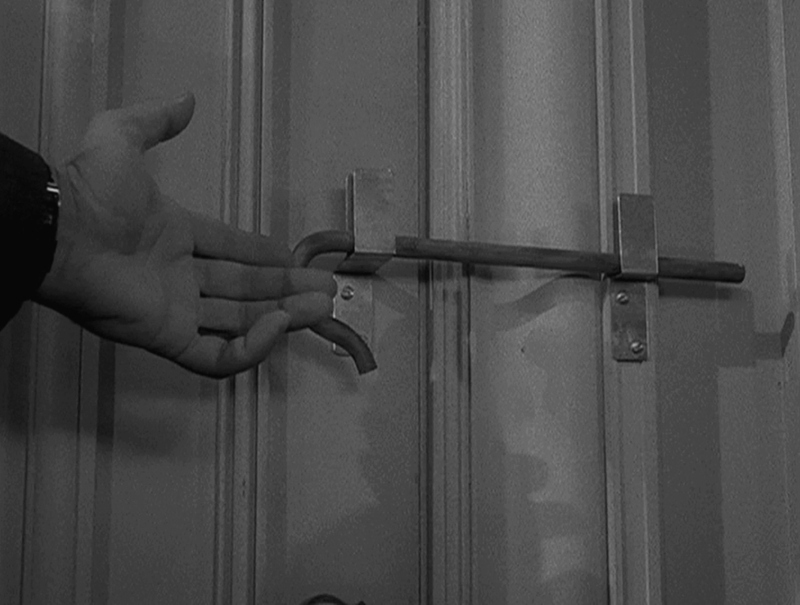 But if you’re a Twilight Zone fan, and you’ve watched the classic episode “The Howling Man,” you may not be so sure. Get too cocky, and you could wind up sprawled on the floor, watching him escape through the nearest window. That was Mr. Ellington’s fate. 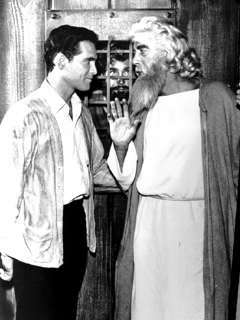 He didn’t believe Brother Jerome, who insisted that the prisoner was a liar. He probably thought, like any of us would, that he was too smart to be deceived. So what did he do wrong? Having watched the episode more than a dozen times once or twice, I think I know. And I have Marc Scott Zicree to thank for it. Zicree is the author of “The Twilight Zone Companion”, which I’ve read many times. One of the things that makes his book stand out is how often he uses publicity pics to illustrate the episodes (at least at the start of each write-up). Rather than a still from the episode itself, we’ll see the actors in some pose that may or may not reflect anything that happened in the story. It suddenly struck me as I rewatched the episode one time why this pic seemed so … off, I guess you could say. It’s this: You never see Brother Jerome right outside the Howling Man’s cell. Why? Jerome doesn’t say, but I think I know. He knows how cunning the Howling Man is — how sympathetic he can seem. How nice and normal. 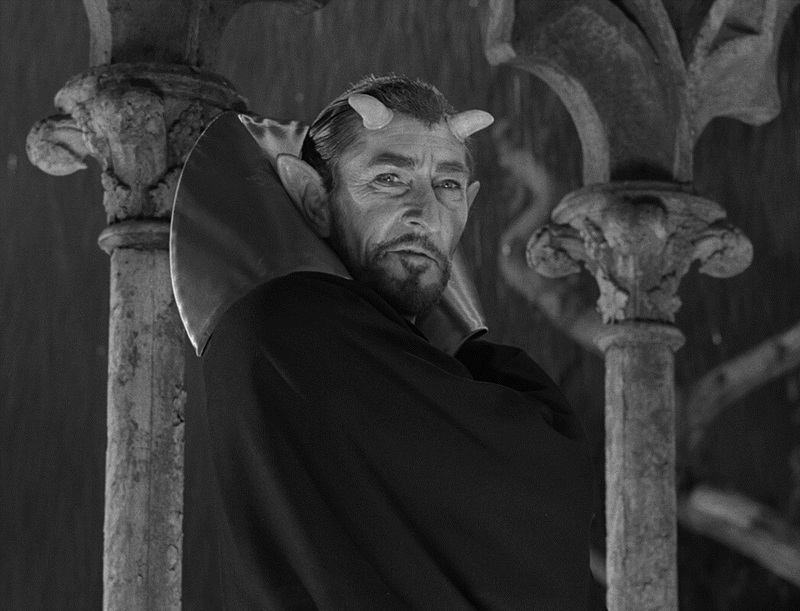 So much so that he doesn’t even trust himself, despite knowing beyond a shadow of a doubt who the Howling Man really is. 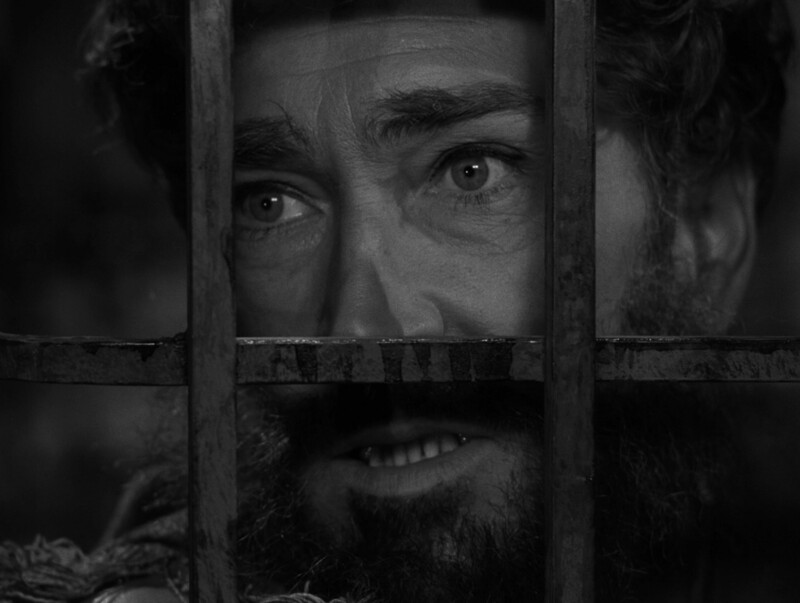 So although it seems highly unlikely that he, of all people, could be fooled, he stays away from the cell entirely. Mr. Ellington doesn’t — and we all know the rest. The casting is ideal. No matter how many times you’ve seen the episode, the silver-tongued Robin Hughes comes off as entirely believable. He seems so much like an innocent victim who’s been trapped by some crazed fanatic that you almost want to step past Mr. Ellington and open the door yourself. Brother Jerome knew better. He didn’t even give the Devil an audience. Try to out-argue the Prince of Lies? Pffft. You may think you can, but it’s foolish to try. Throw him in a cell, and don’t listen to a word. For a daily dose of Serling, you can follow me on Twitter, Facebook or Pinterest. You can also get email notifications of future posts by entering your address under “Follow S&S Via Email” on the upper left-hand side of this post. 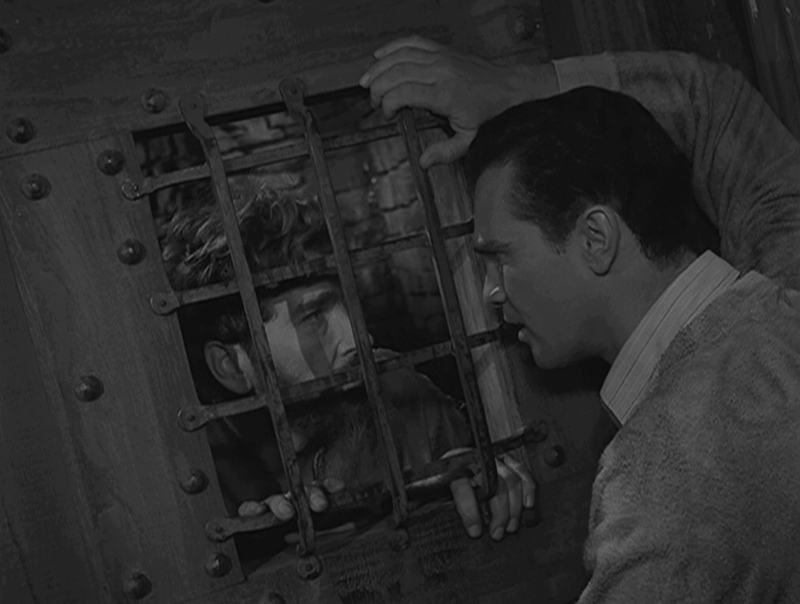 Posted on 09/02/2016, in Twilight Zone and tagged Charles Beaumont, The Howling Man, Twilight Zone. Bookmark the permalink. 16 Comments. Love this episode. I hadn’t really given it much thought before, but you’re completely right — this is the reason Jerome is never seen outside the cell. An alcoholic knows to not even set foot in a bar, lest he give in to temptation. And what is more tempting than to believe the Devil’s lies? Seriously! “Is it wrong to kiss?” Slick as they come, that one. We should all imitate Jerome, and steer clear. I must assume that — unlike another T-Zone character — the devil’s vocal chords can’t be surgically severed. I like your theory, Paul. I think the powers of persuasion would work on anyone. It’s one of those: “I wouldn’t fall for that but let’s hope I never get tested” situations. Exactly. Even Frodo failed at the end of “The Lord of the Rings”. Temptation can sway any of us. Thanks, Dan! I have to say this is one of my favorite episodes. Mine too. Such an iconic episode. I watched this episode last week, as it turns out, the night after I watched “Escape Clause”, a much more comedic episode featuring the same villain. Beaumont’s short story (with a slightly happier ending) is also a favorite of mine, but, boy, Carradine is just as mesmerizing on screen as Robin Hughes. Many TZ episodes (due to budget limits) take place mostly as a conversation between two characters, and this is one of the best examples of the bunch. Yes, I liked Beaumont’s original story, which does have a happier ending, but I also like how he adapted it for TZ. Having the HM released again was all too fitting. And yes, what a cast! Carradine, Hughes and Wynant are ideal. No wonder it’s enjoyable to watch no matter how many times you’ve seen it. Great post! Another of my favorite episodes. A while back, I blogged about Beaumont’s original short story from which this episode was based. At https://bibliophilica.wordpress.com/2013/11/07/have-you-ever-heard-the-howling-man/ if you’d care to see. Just gave it a read and left a comment, Jay. Good stuff! Very interesting, I never really thought about it. I agree! In 2nd Corinthians 2:11 it says “…so that we may not be overreached by Satan, for we are not ignorant of his designs.” Jerome wasn’t, but he also knew how crafty and cunning he was and stayed as far as possible. Yes indeed. The good brother surely knew he had to give the Father of Lies a wide berth. 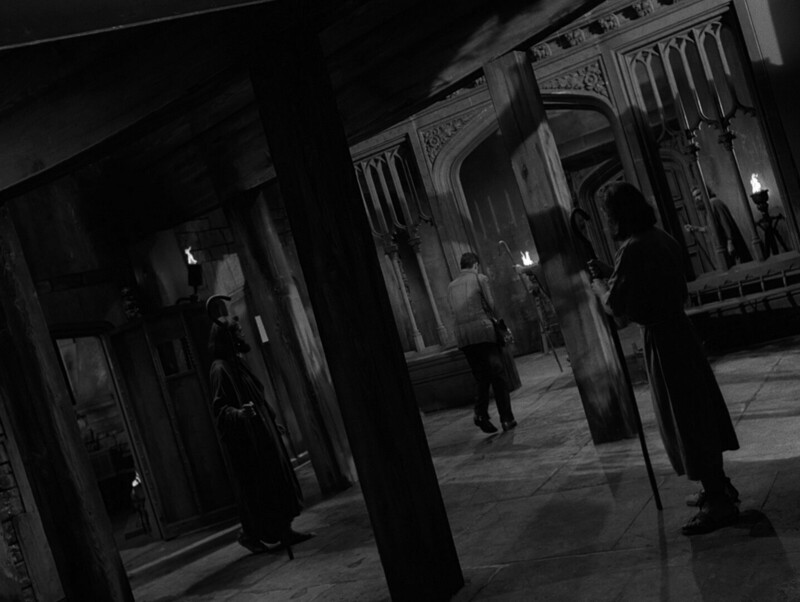 THE HOWLING MAN – So many classic TZ episodes to choose from, but this has to be at least in the top five best episodes.